COULD THIS BE PIERPALO PICCIOLI'S LAST COLLECTION FOR VALENTINO? Home » Show Reports » Trend Reports » PFW » COULD THIS BE PIERPAOLO PICCIOLI’S LAST COLLECTION FOR VALENTINO? COULD THIS BE PIERPAOLO PICCIOLI’S LAST COLLECTION FOR VALENTINO? The first part of Pierpaolo Piccioli’s spring-summer 2019 offering at Valentino could be read as the designer’s departure from the magnificent, Italian glamour he channeled in the past few seasons. With Kristen McMenamy and Maria Carla Boscono on the runway, Piccioli sent down an all-black line-up of minimally cut dresses with balloon sleeves, ball skirts and loosely fit suits. It’s been a while since we’ve seen such an impressive use of black, especially for summer. Somehow, the effect was far from solemn. 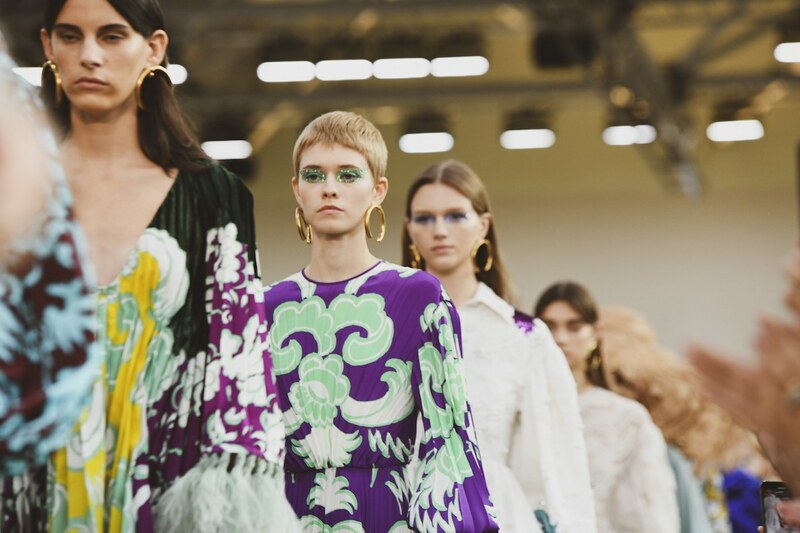 But, if you missed Pierpaolo’s recent fashion galore, here you are: somewhere in the middle of the collection, a colour explosion took place. Valentino red looked less dramatic, but more joyous. Matisse and Gaugin-inspired prints were used for mini-dresses that got as well trimmed with feathers. This season’s use of tulle (delightfully pleated) as well-made Valentino’s ready-to-wear top the ranks for the evening occasions. One can’t forget the huge, straw hats that brought even more glory to the collection. Piccioli is growing stronger and stronger as the sole creative director at the house. It’s a pleasure to watch him do wonders. This entry was posted in Paris, PFW, Trend Reports and tagged Pierpalo Piccioli, SS19, valentino. Bookmark the permalink.